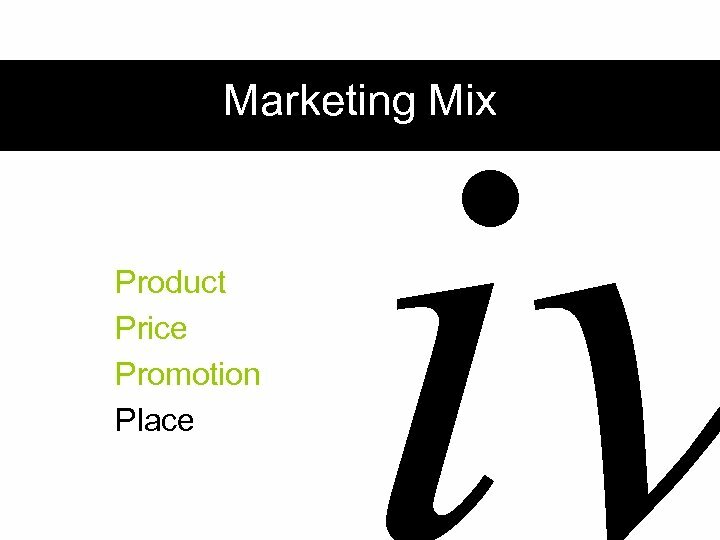 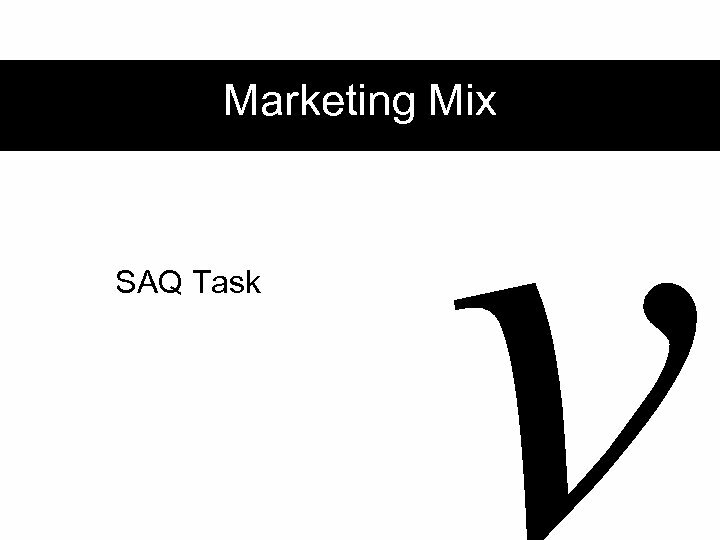 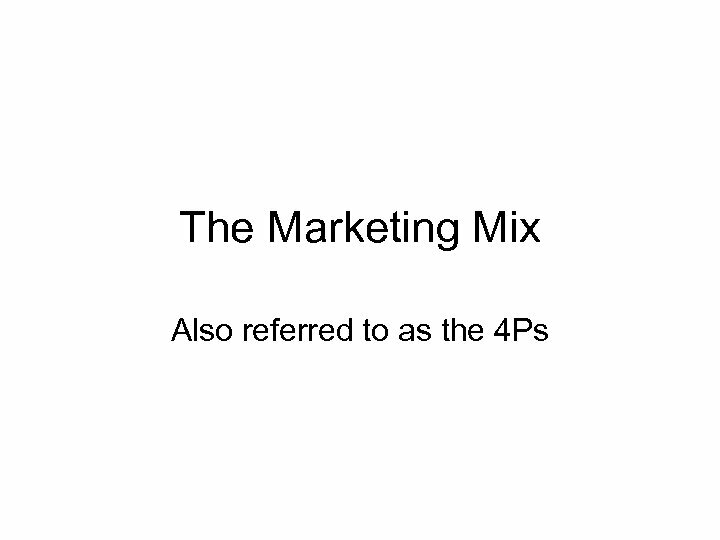 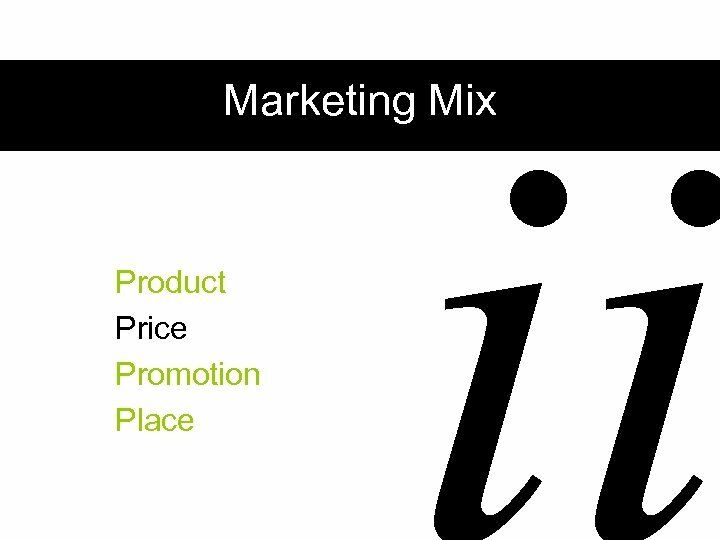 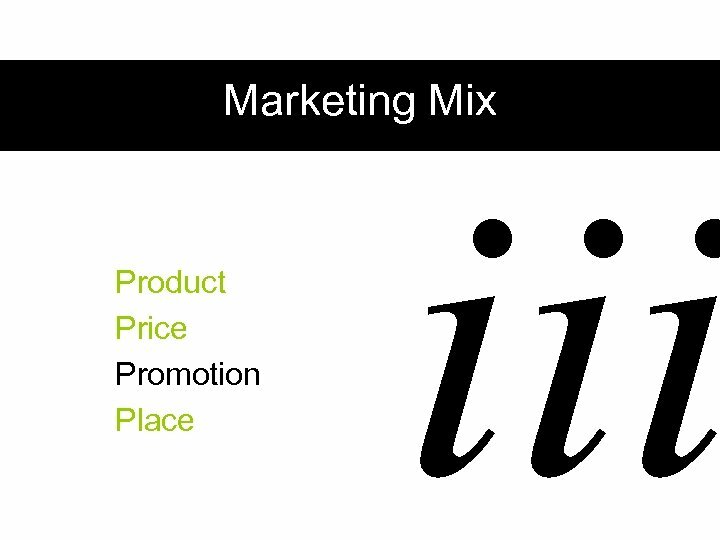 Marketing Mix The balance of product, price promotion and place is the key to products being successful in the market place. 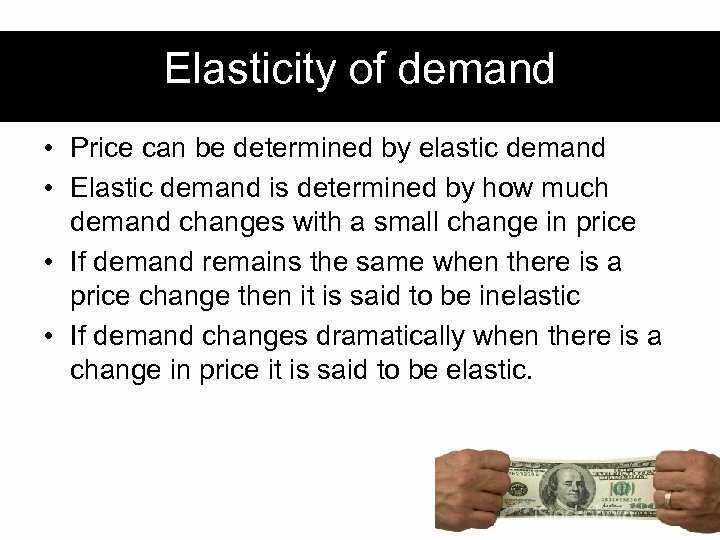 Elasticity of demand • Price can be determined by elastic demand • Elastic demand is determined by how much demand changes with a small change in price • If demand remains the same when there is a price change then it is said to be inelastic • If demand changes dramatically when there is a change in price it is said to be elastic. 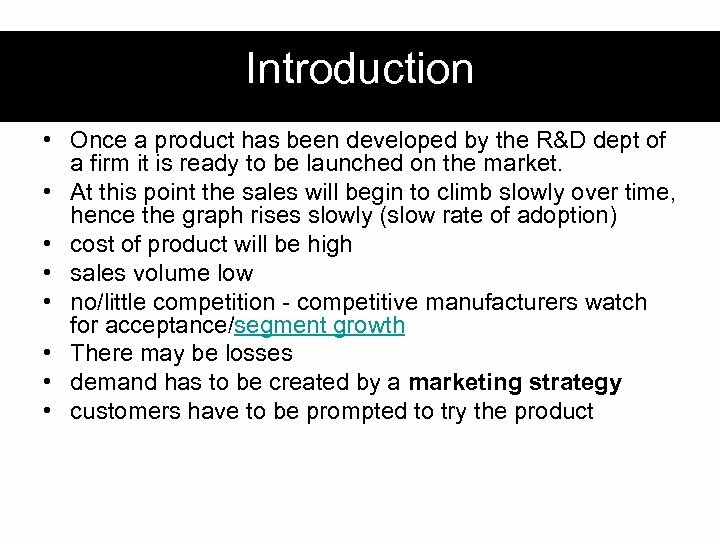 What the market will bear • Price can be affected by the type of product being sold • Radically new products are harder to determine a price for than products that are developments on existing offerings. 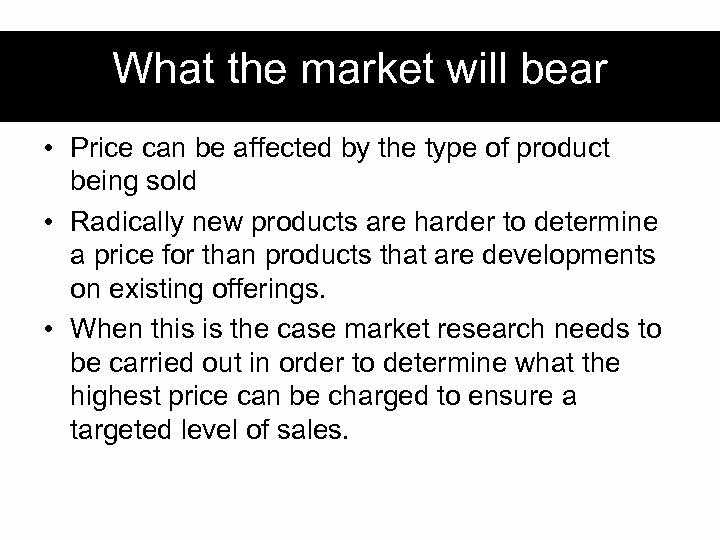 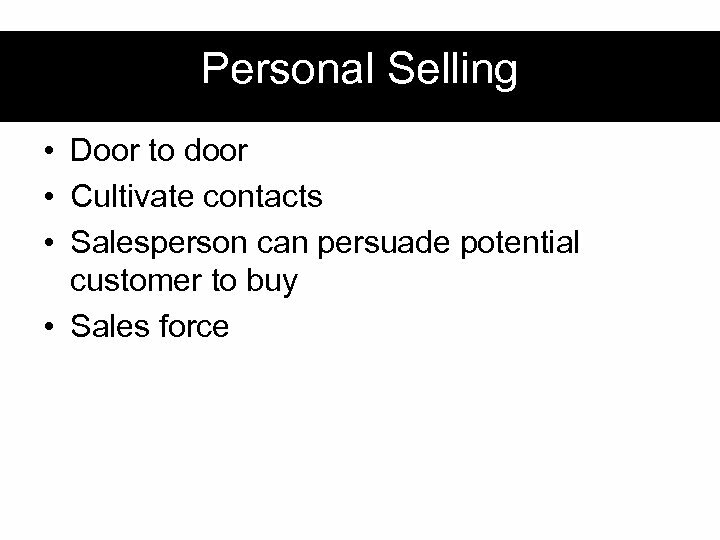 • When this is the case market research needs to be carried out in order to determine what the highest price can be charged to ensure a targeted level of sales. 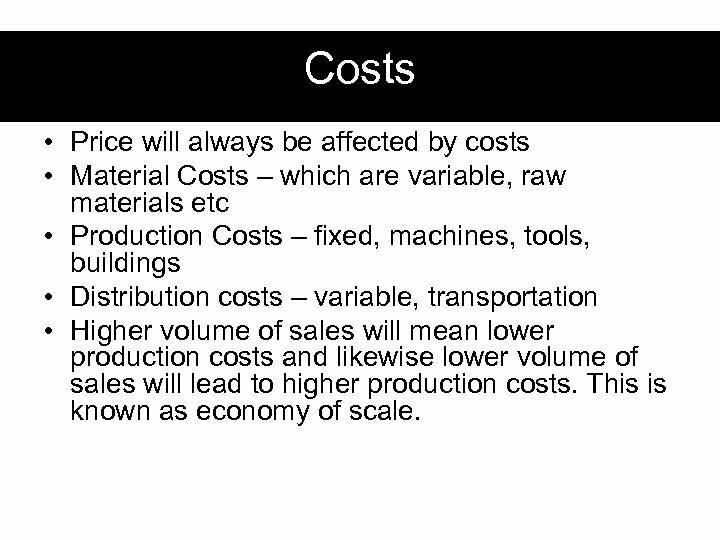 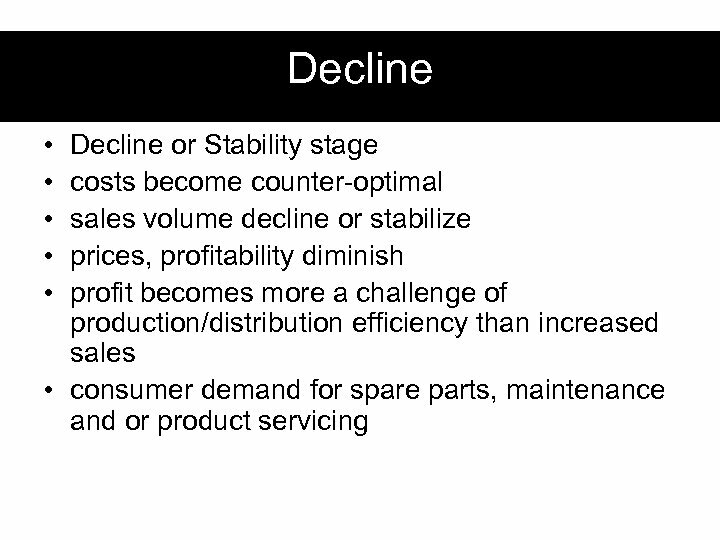 Costs • Price will always be affected by costs • Material Costs – which are variable, raw materials etc • Production Costs – fixed, machines, tools, buildings • Distribution costs – variable, transportation • Higher volume of sales will mean lower production costs and likewise lower volume of sales will lead to higher production costs. 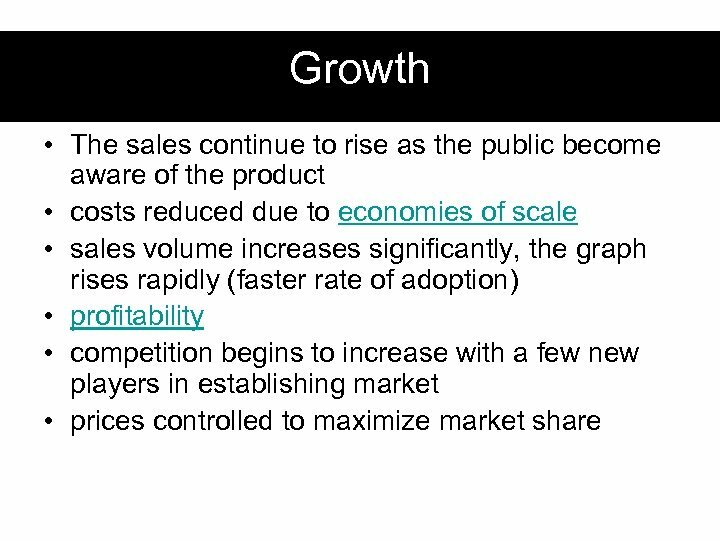 This is known as economy of scale. 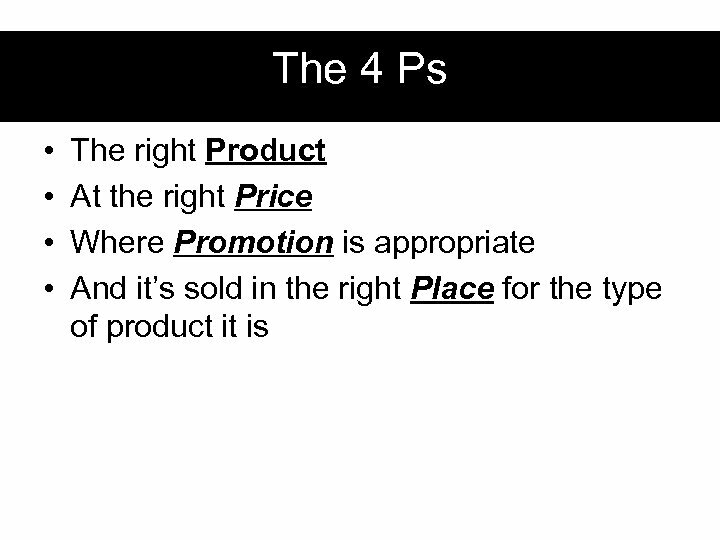 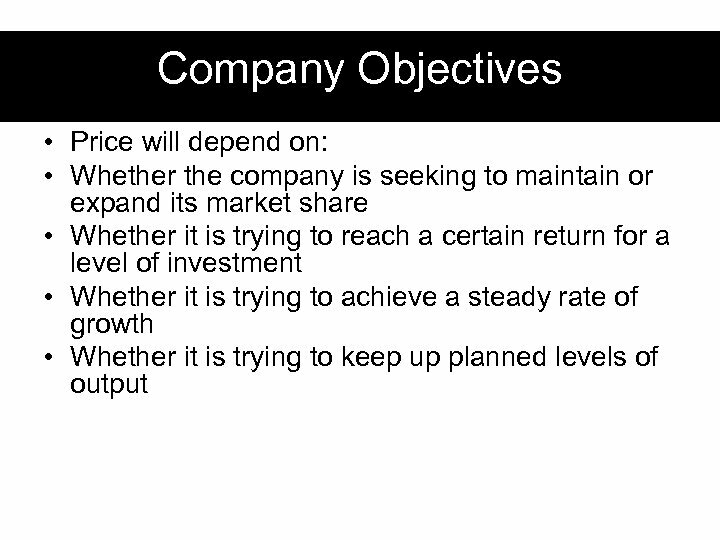 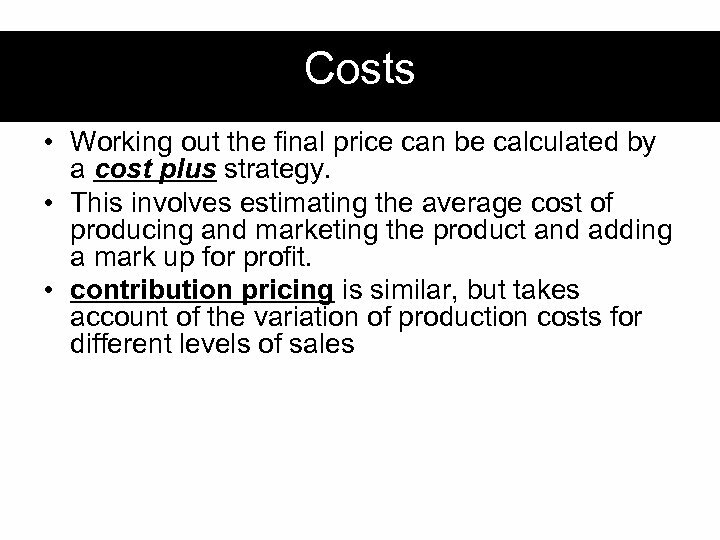 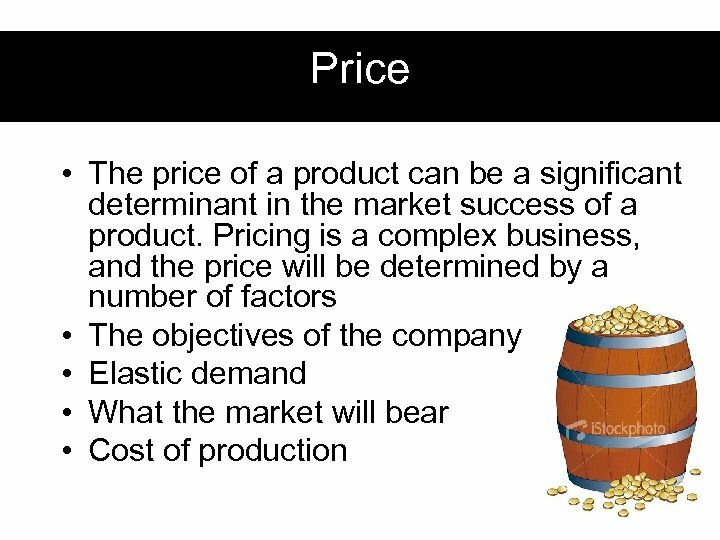 Price • A company may choose to not to use any of the above to determine the price. 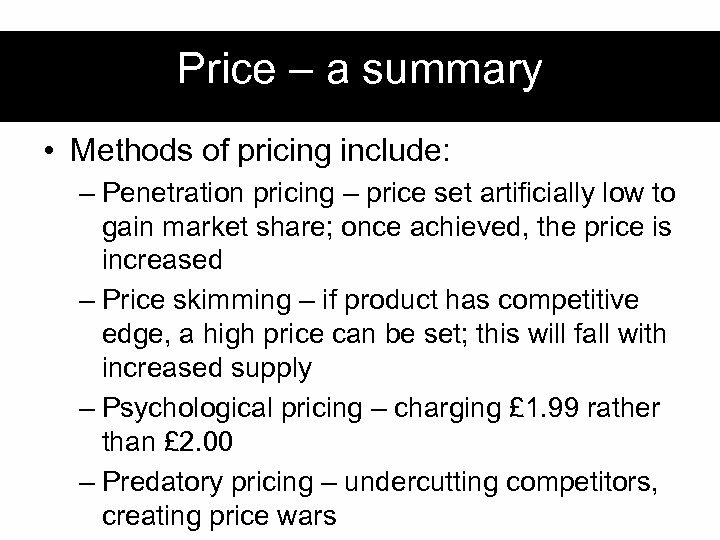 • It could set it’s price to compete with a rival company. 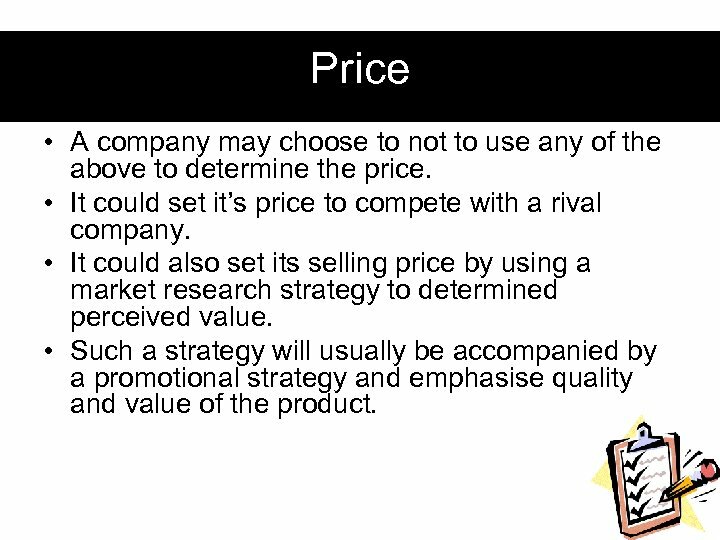 • It could also set its selling price by using a market research strategy to determined perceived value. 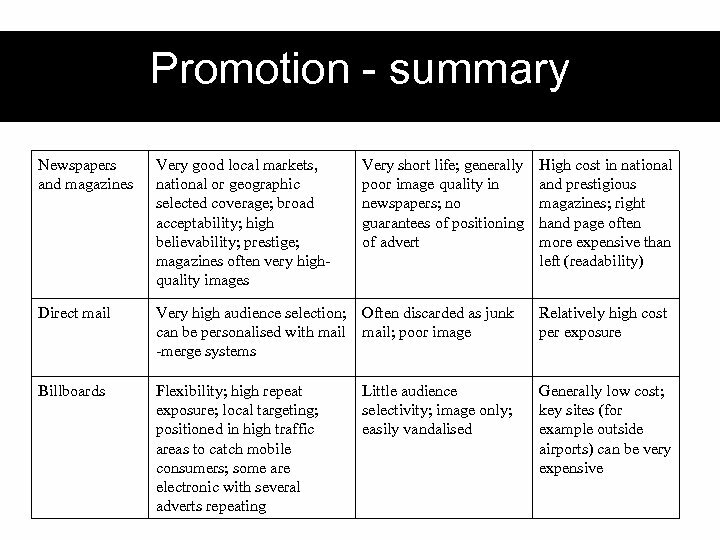 • Such a strategy will usually be accompanied by a promotional strategy and emphasise quality and value of the product. 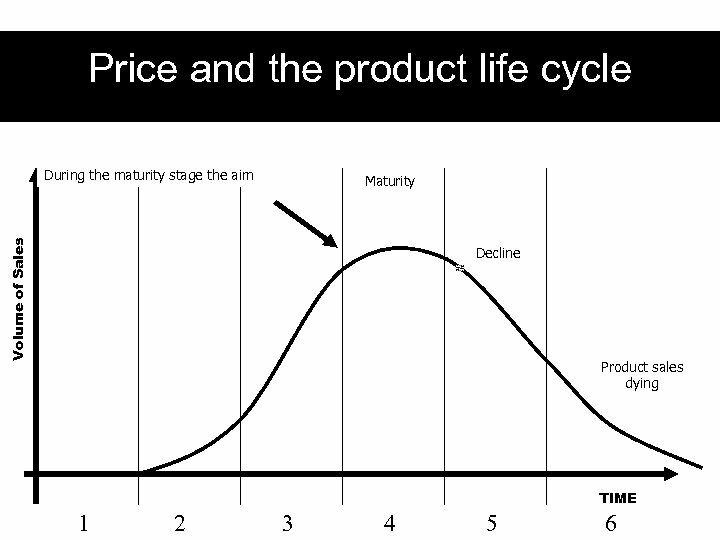 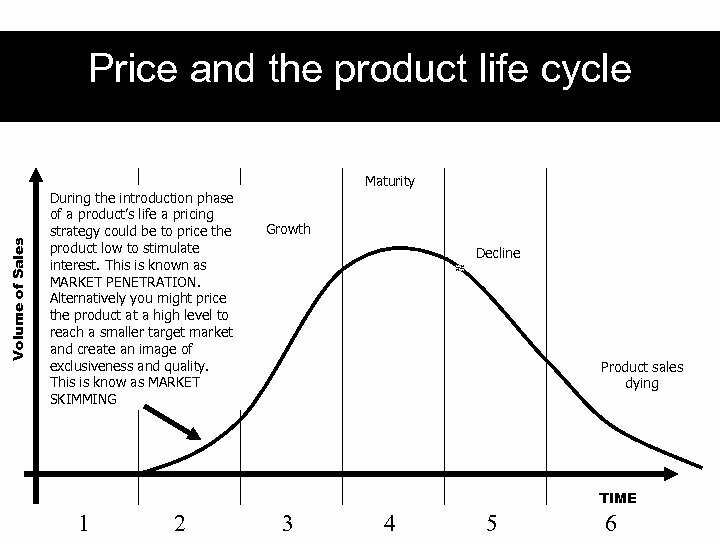 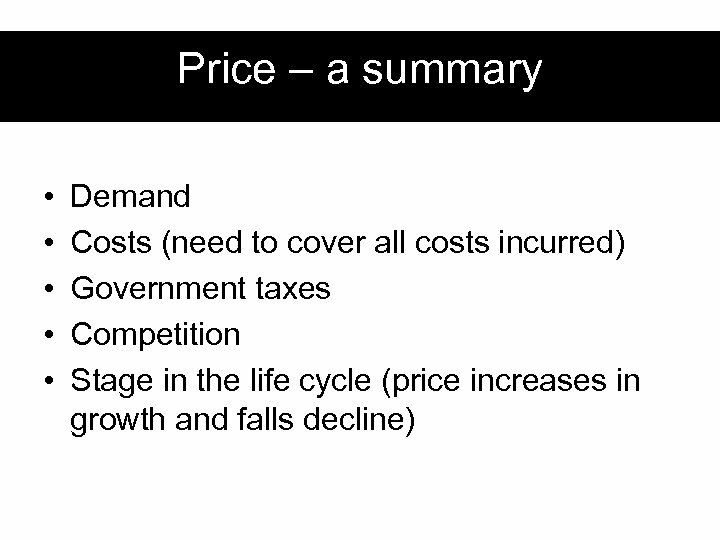 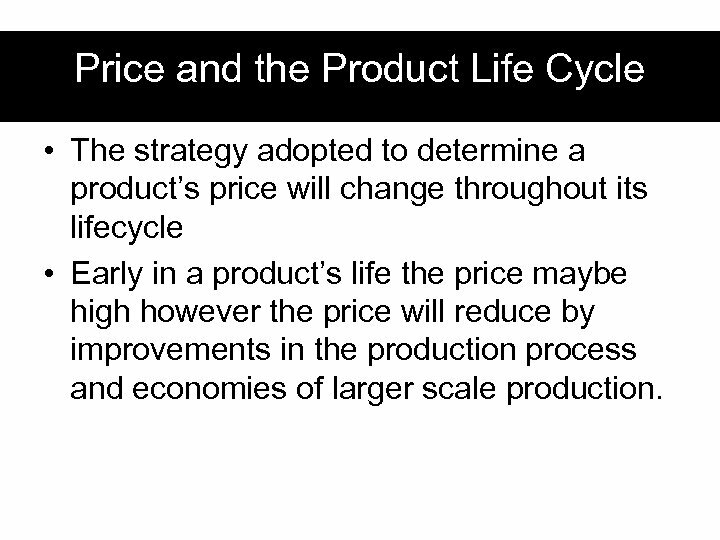 Price and the Product Life Cycle • The strategy adopted to determine a product’s price will change throughout its lifecycle • Early in a product’s life the price maybe high however the price will reduce by improvements in the production process and economies of larger scale production. 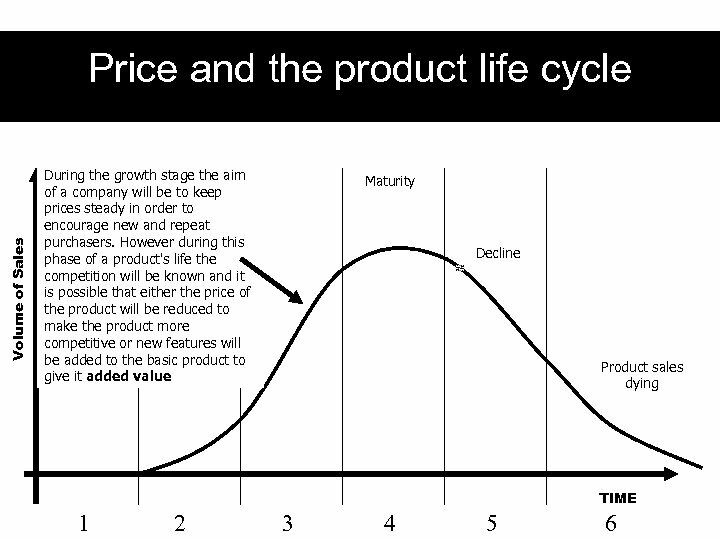 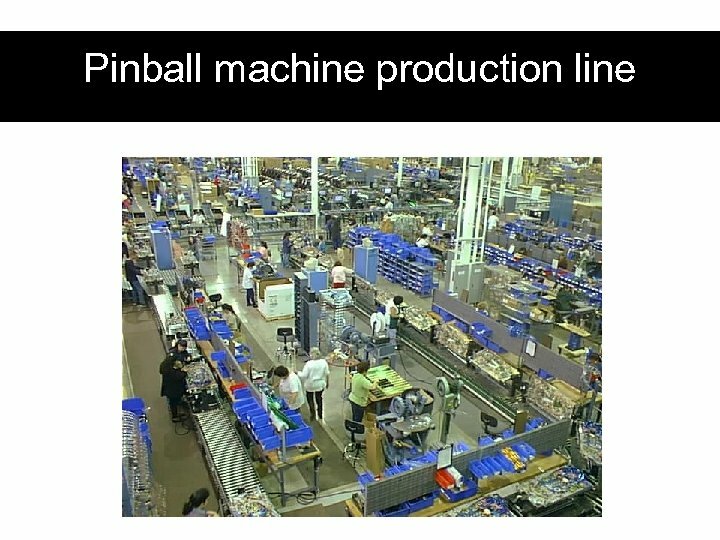 Trigger and Incremental Products • Another aspect of product development is the distinction between trigger and incremental products a company will sell. 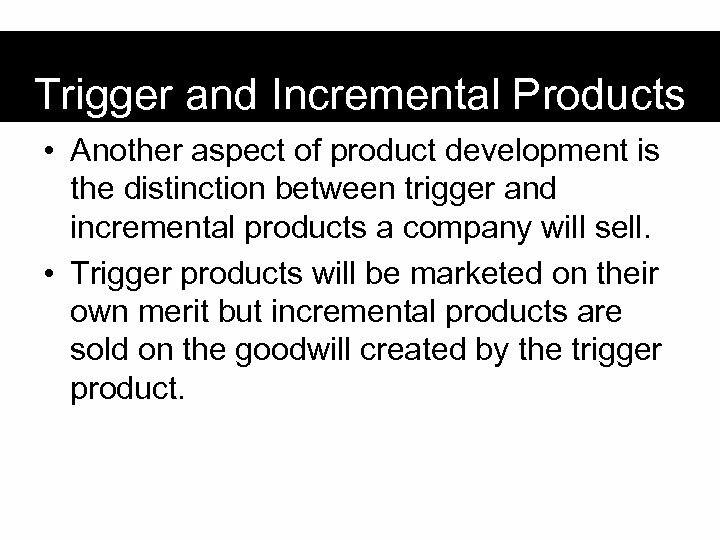 • Trigger products will be marketed on their own merit but incremental products are sold on the goodwill created by the trigger product. 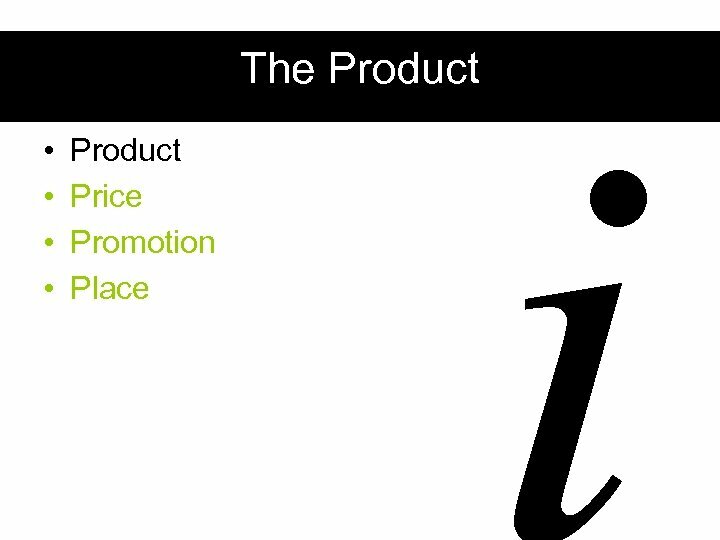 Trigger Products • TRIGGER products are key products in a company’s product range which will prompt a potential customer to make a purchase. 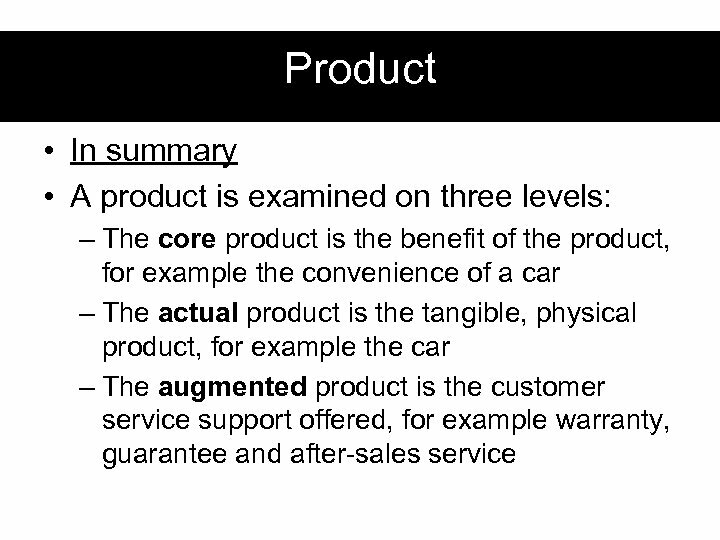 • Examples are computer hardware and the operating software. 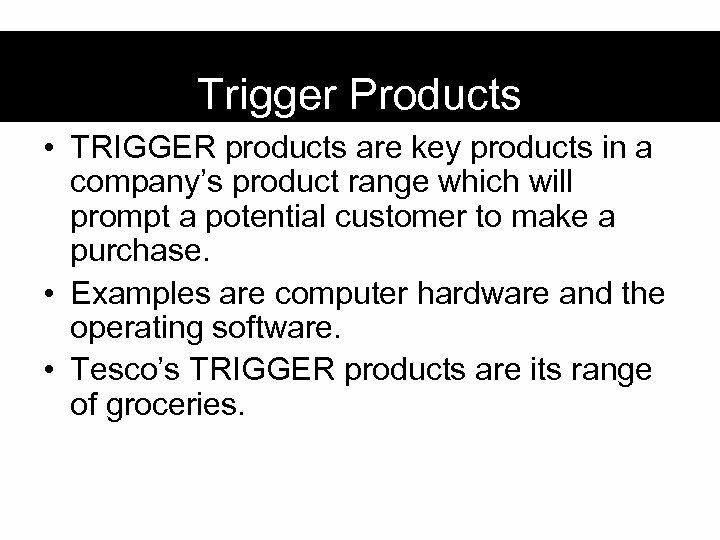 • Tesco’s TRIGGER products are its range of groceries. 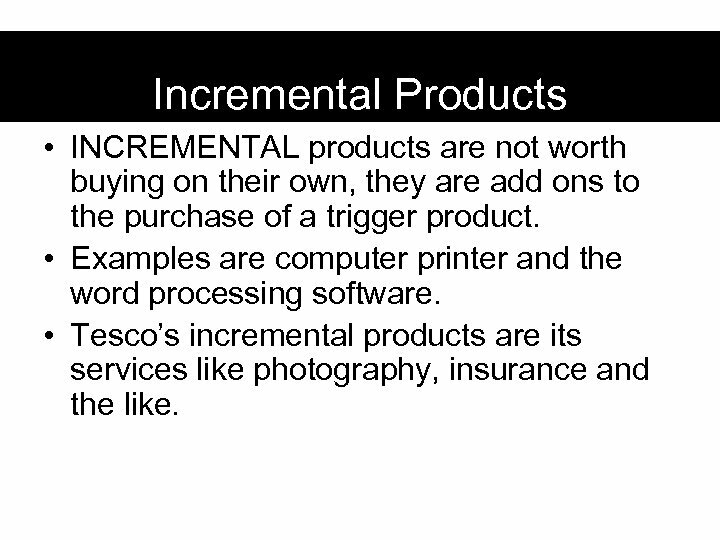 Incremental Products • INCREMENTAL products are not worth buying on their own, they are add ons to the purchase of a trigger product. 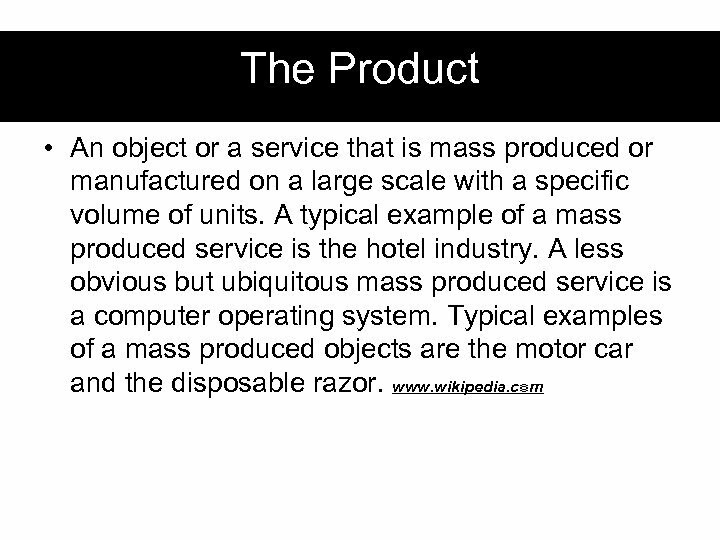 • Examples are computer printer and the word processing software. 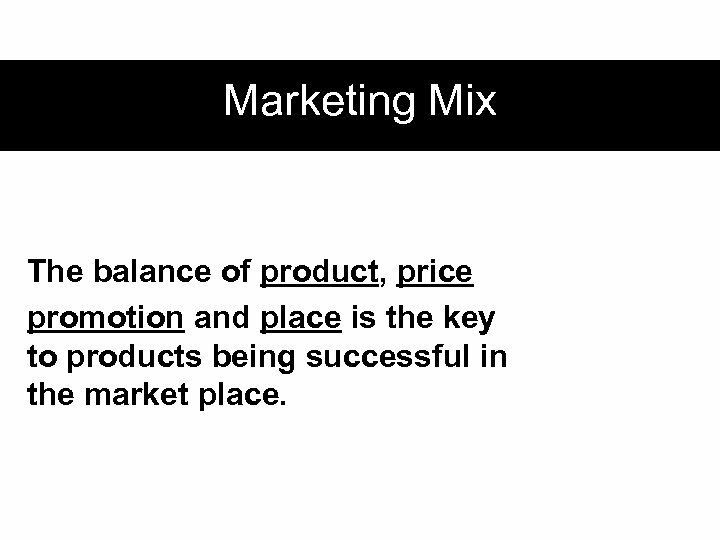 • Tesco’s incremental products are its services like photography, insurance and the like. 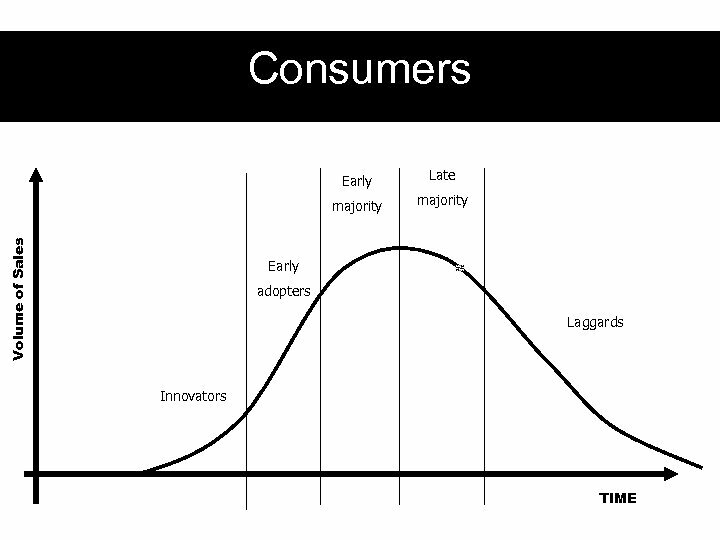 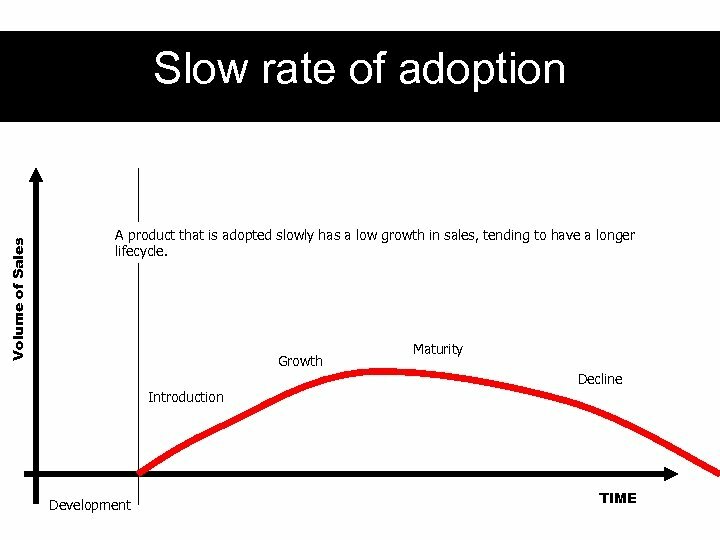 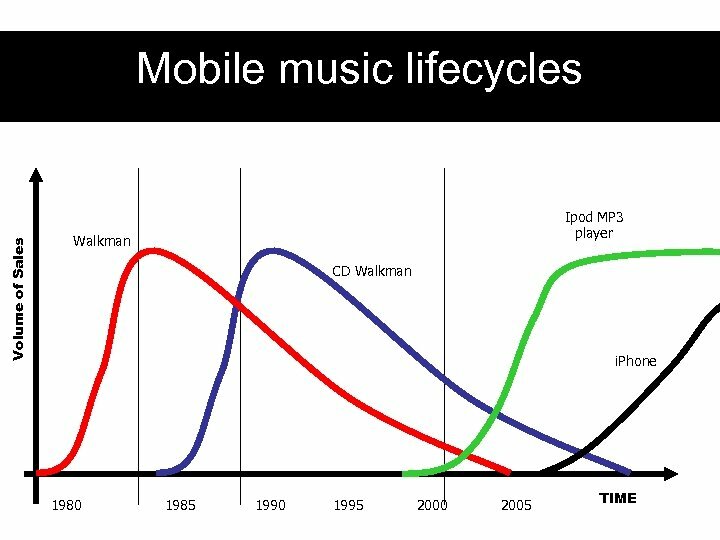 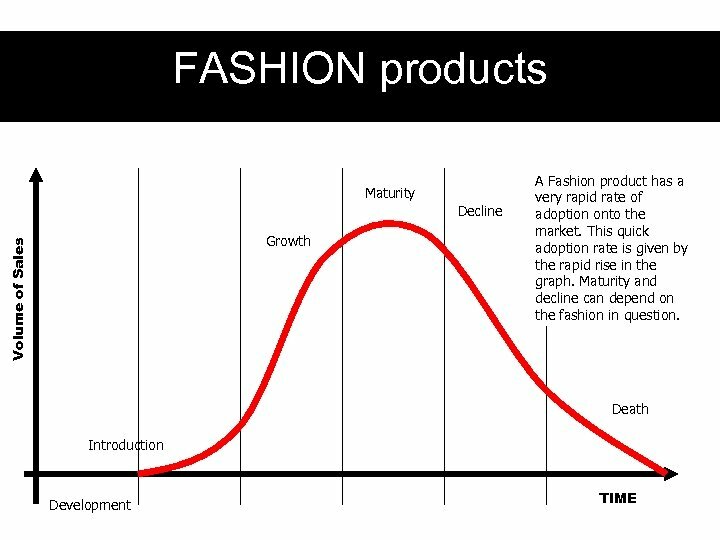 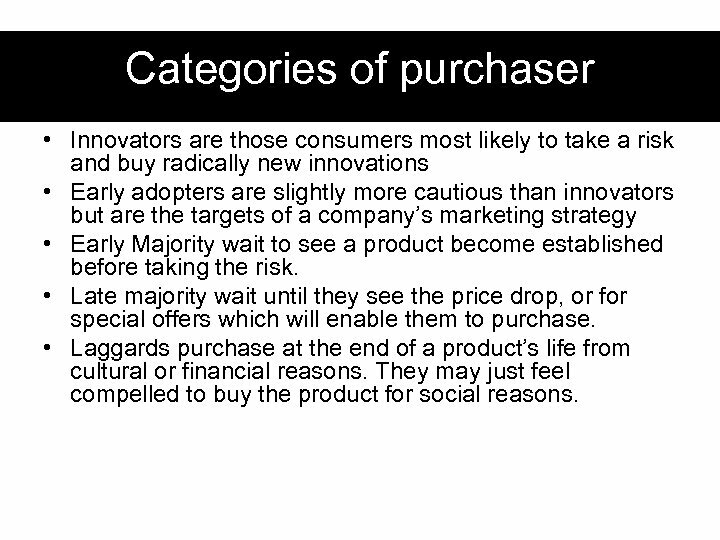 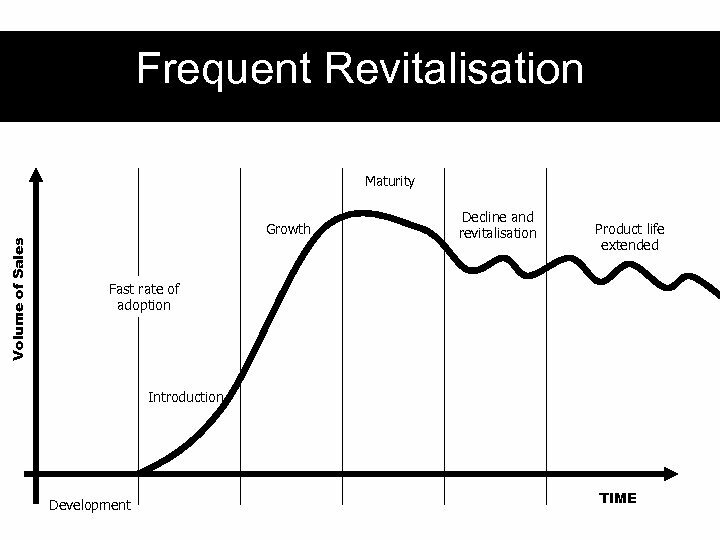 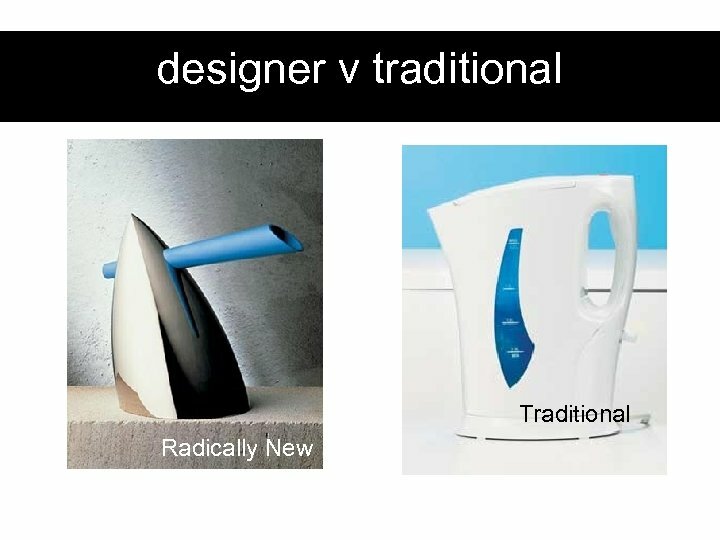 Categories of purchaser • Innovators are those consumers most likely to take a risk and buy radically new innovations • Early adopters are slightly more cautious than innovators but are the targets of a company’s marketing strategy • Early Majority wait to see a product become established before taking the risk. 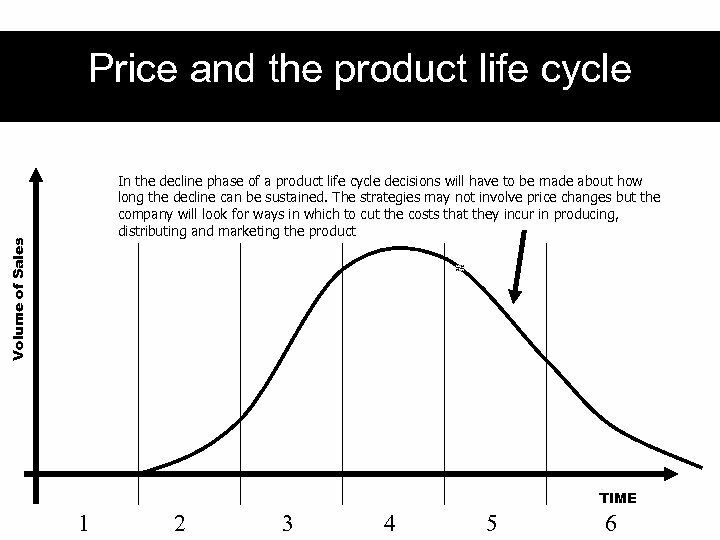 • Late majority wait until they see the price drop, or for special offers which will enable them to purchase. 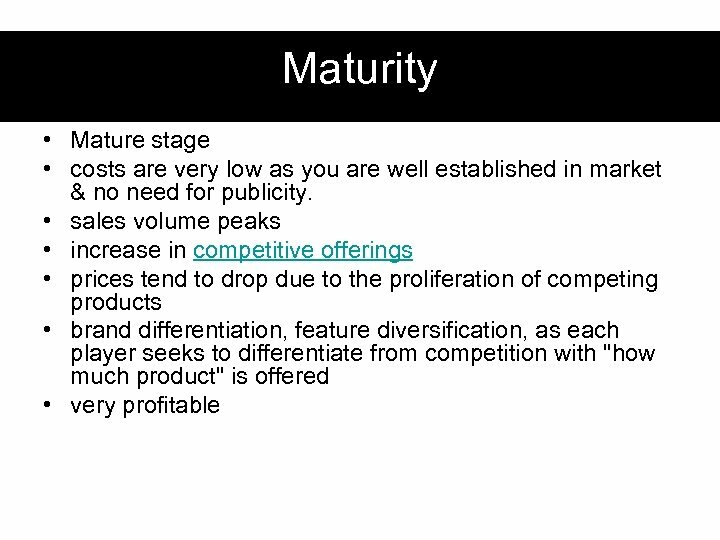 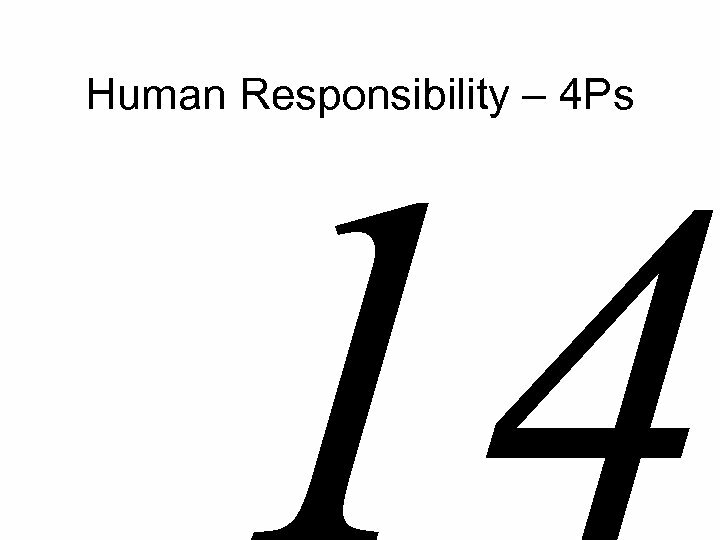 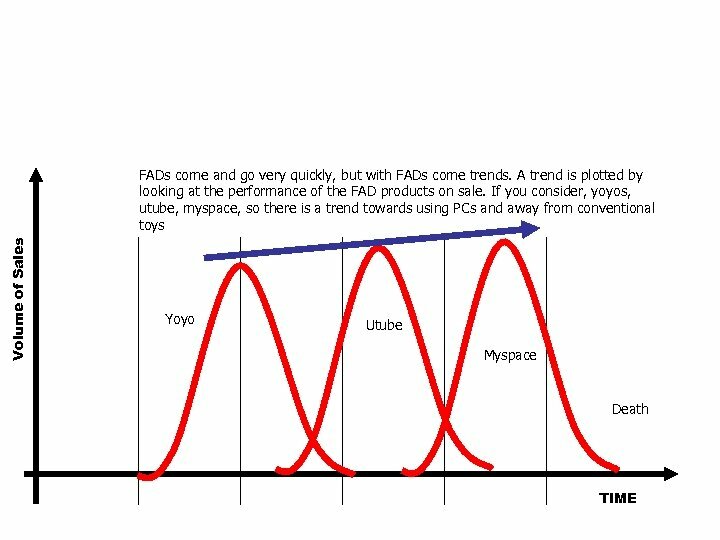 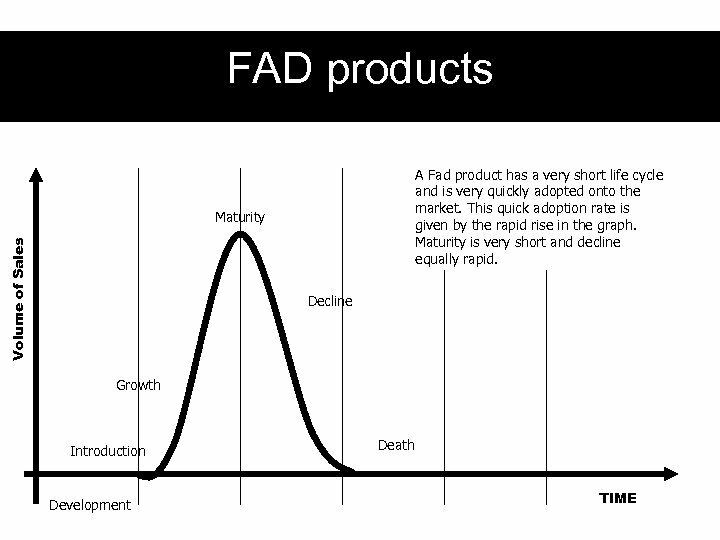 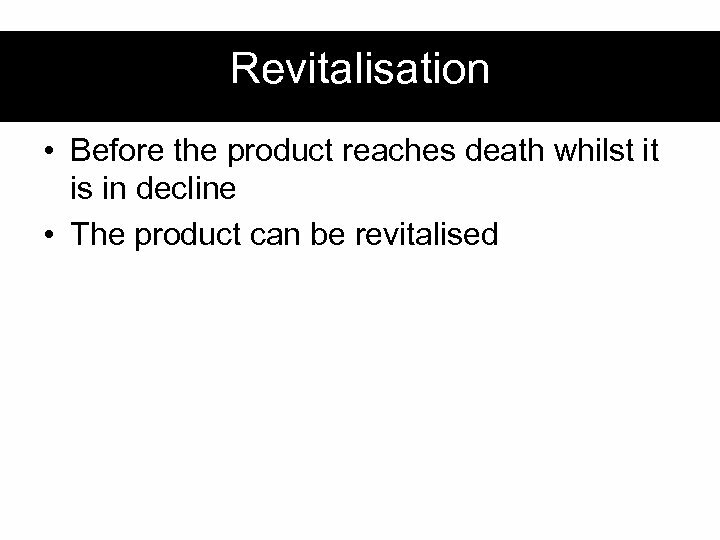 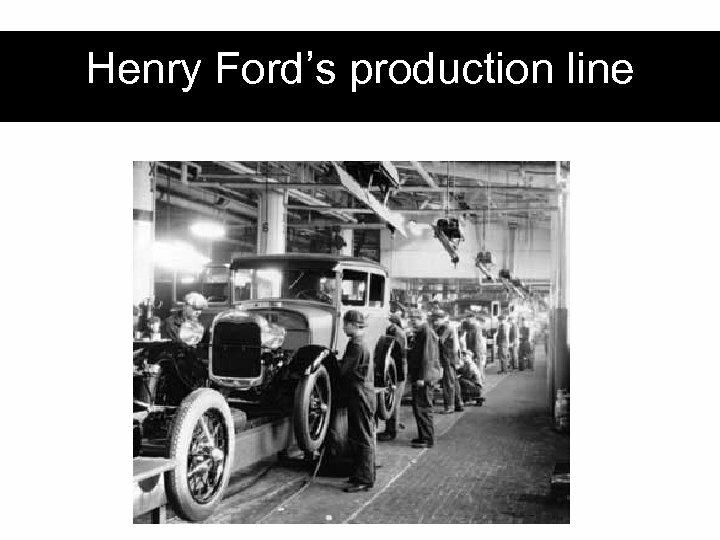 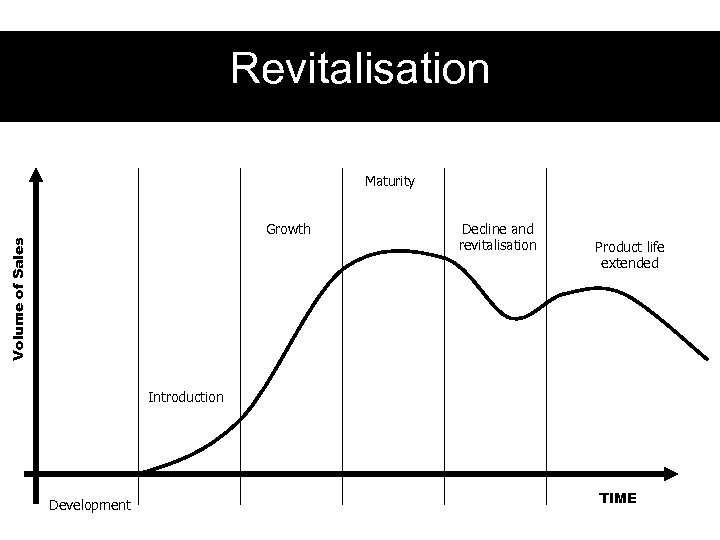 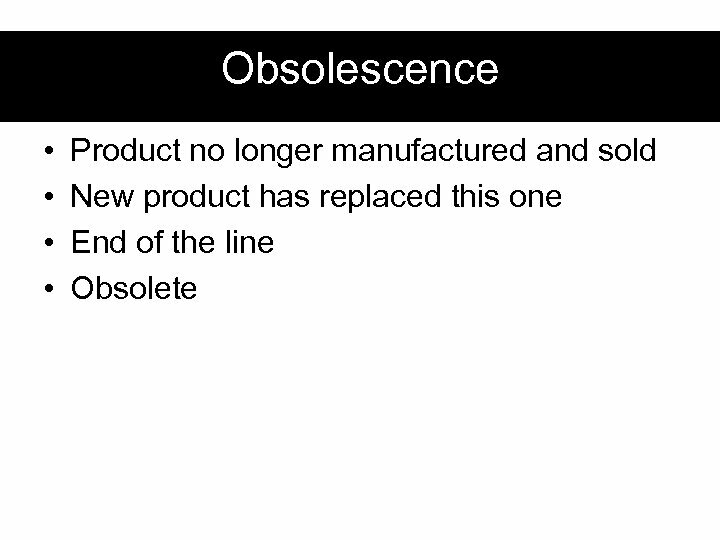 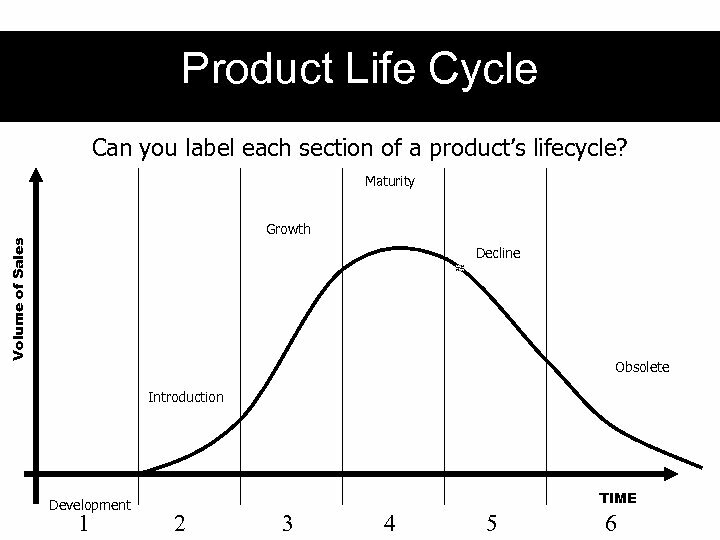 • Laggards purchase at the end of a product’s life from cultural or financial reasons. 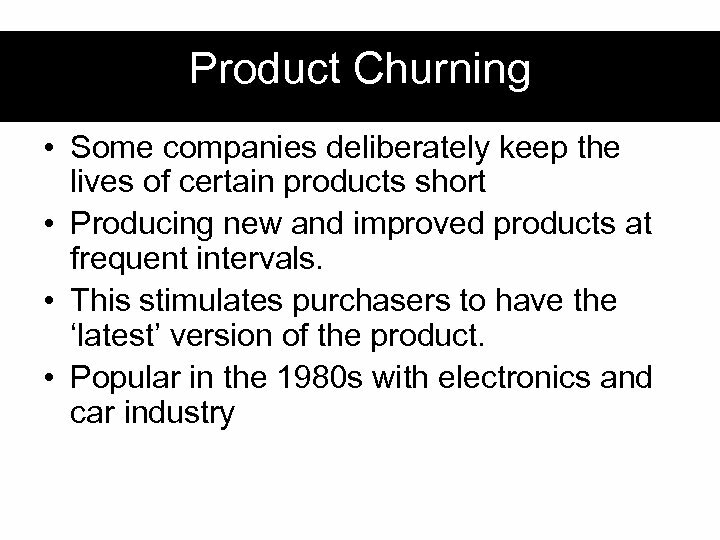 They may just feel compelled to buy the product for social reasons. 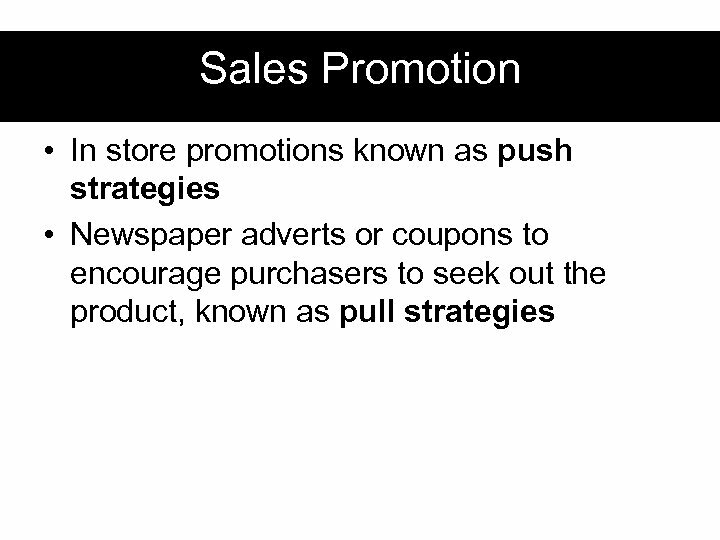 Promotion • If a company’s products are to succeed people need to know about them. 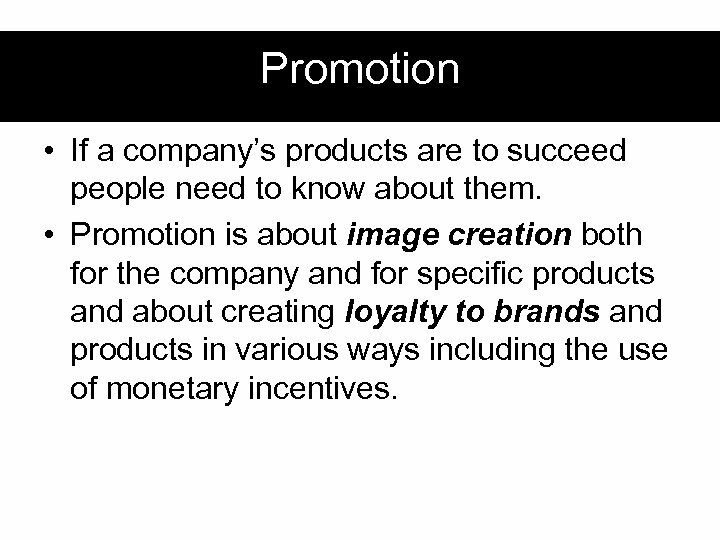 • Promotion is about image creation both for the company and for specific products and about creating loyalty to brands and products in various ways including the use of monetary incentives. 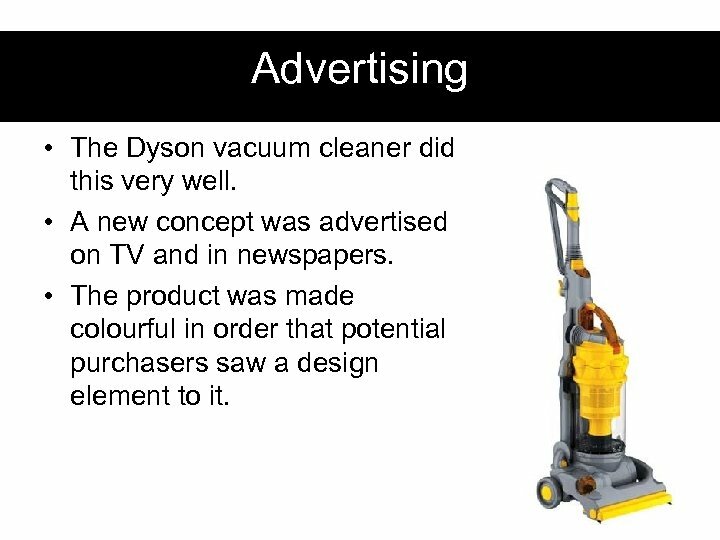 Advertising • The Dyson vacuum cleaner did this very well. 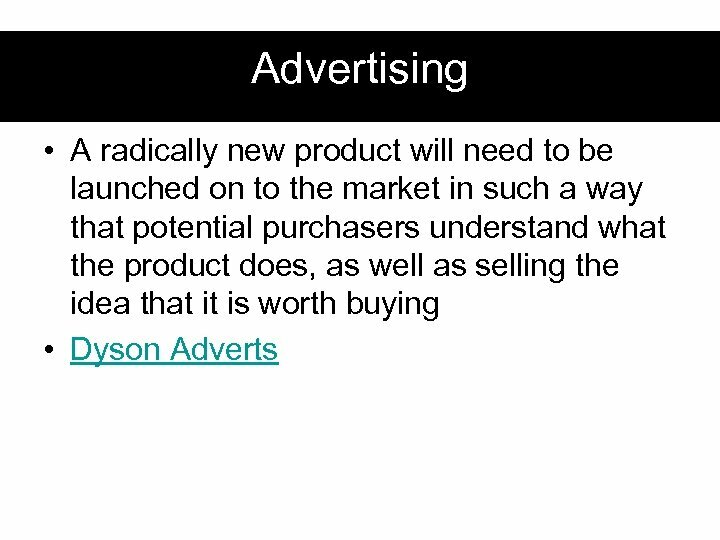 • A new concept was advertised on TV and in newspapers. 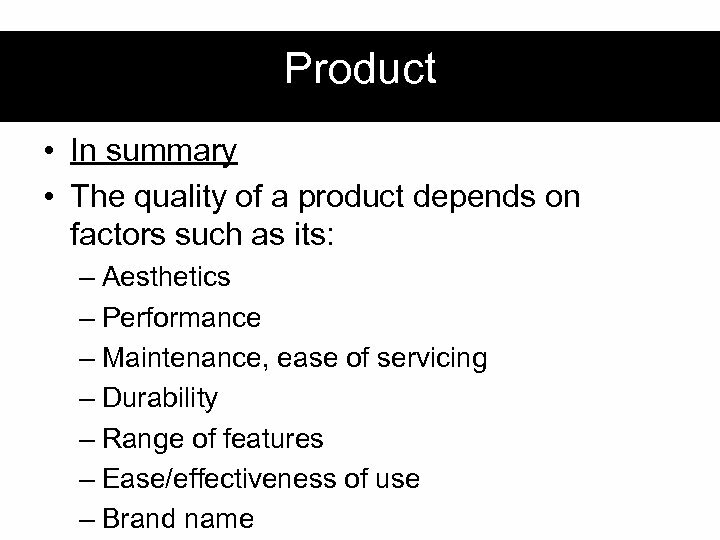 • The product was made colourful in order that potential purchasers saw a design element to it. 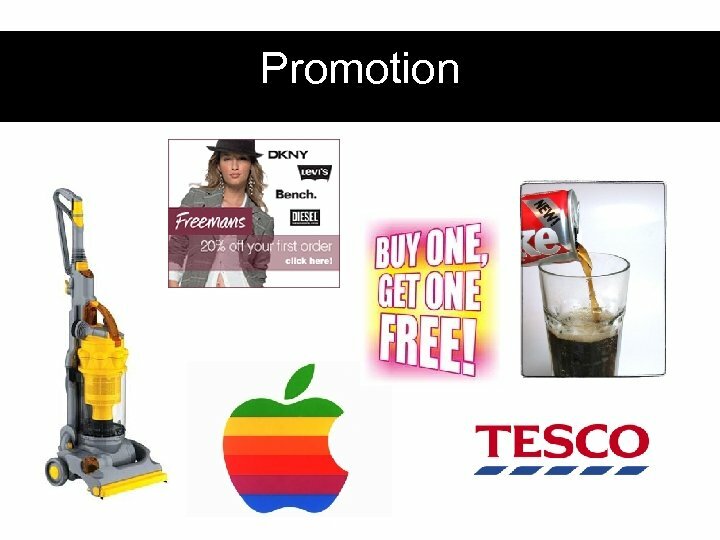 Promotion - summary • Promotion – Decisions have to be made on how best to promote the product and bring it to the attention of potential customers. 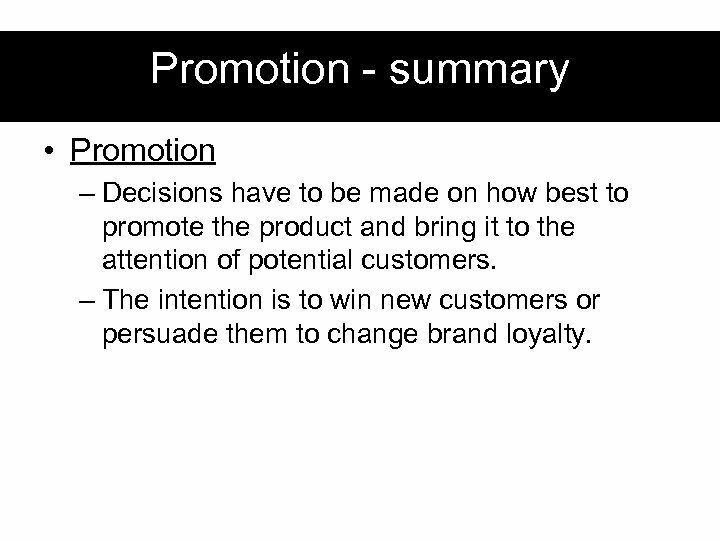 – The intention is to win new customers or persuade them to change brand loyalty. 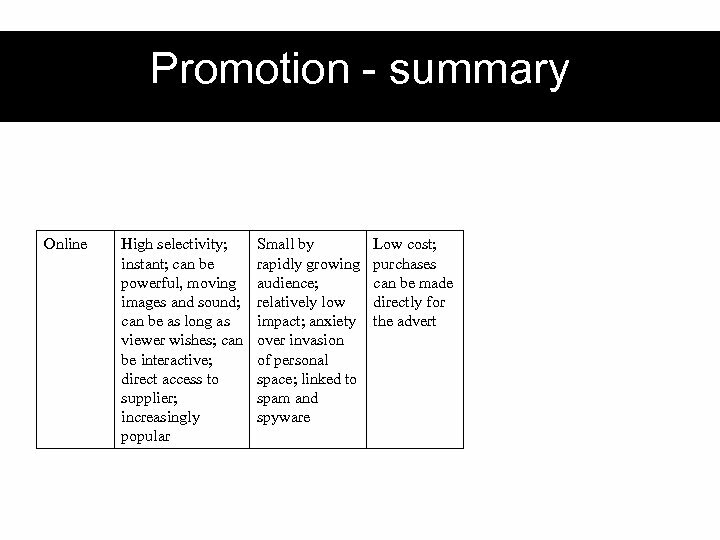 Promotion - summary • Methods include – Short-term promotions such as Buy One Get One Free (BOGOF), competitions and coupons – Exhibitions and trade fairs – Publicity campaigns – Personal selling/sales representatives – Can be expensive and risky, careful budgeting required. 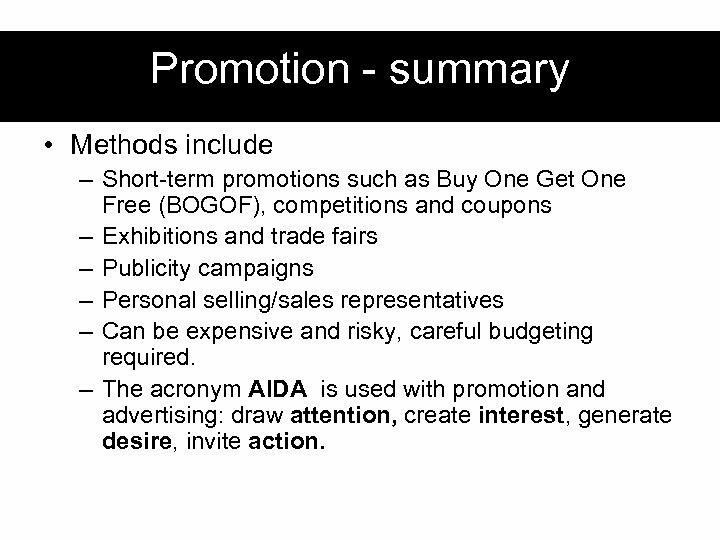 – The acronym AIDA is used with promotion and advertising: draw attention, create interest, generate desire, invite action. 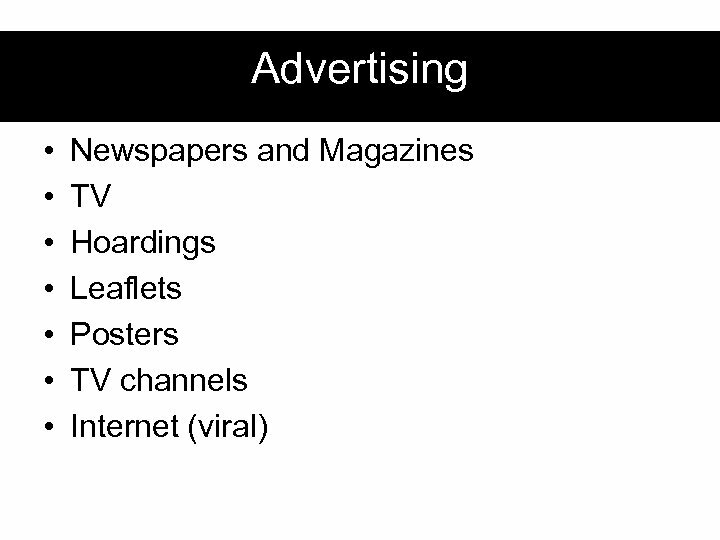 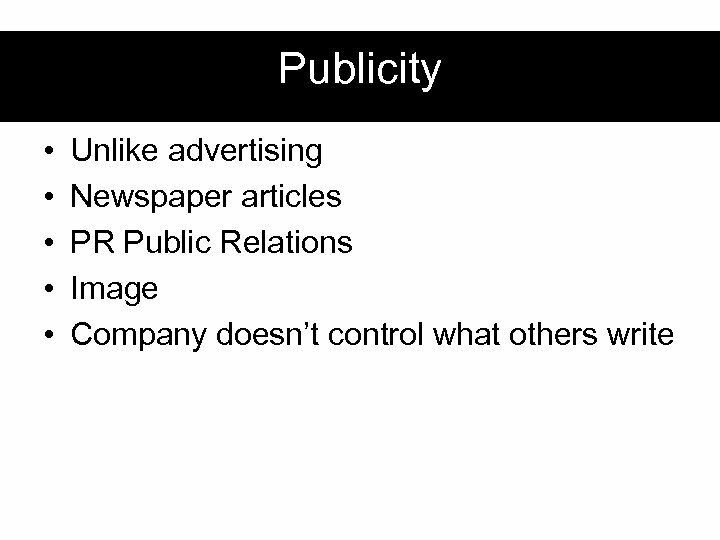 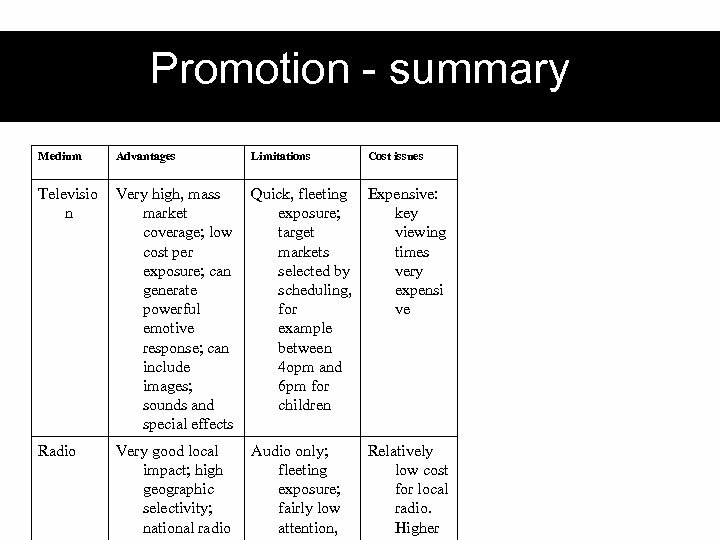 Promotion - summary • Advertising – Advertising is used to bring a product to the attention of potential customers. 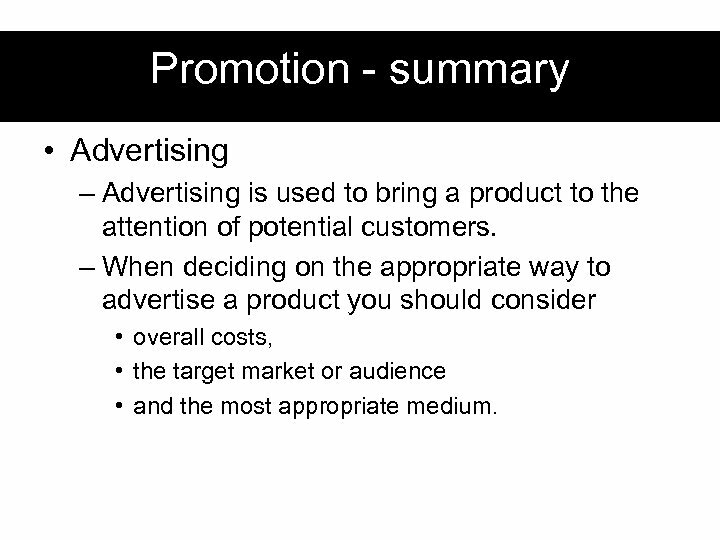 – When deciding on the appropriate way to advertise a product you should consider • overall costs, • the target market or audience • and the most appropriate medium. 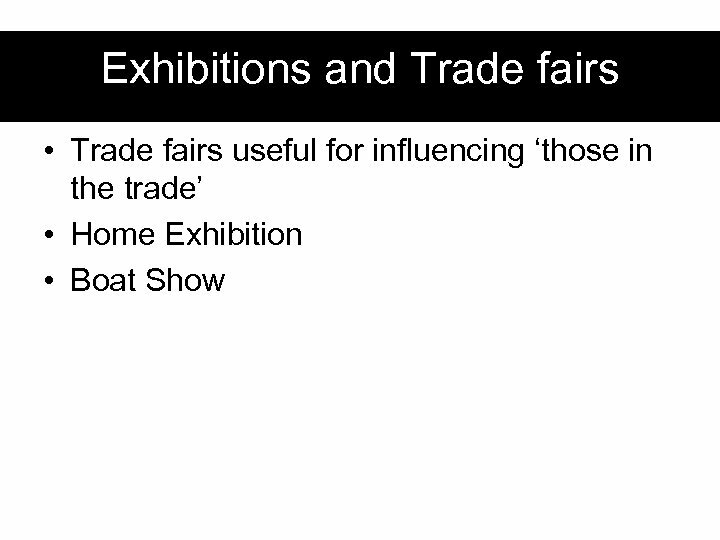 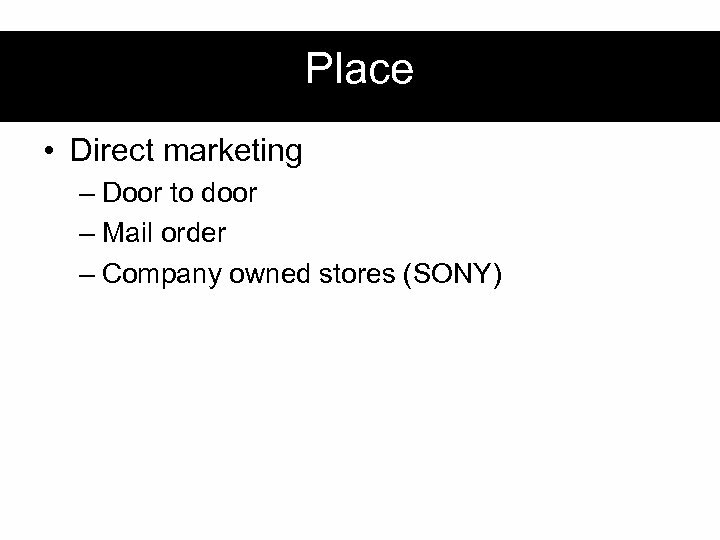 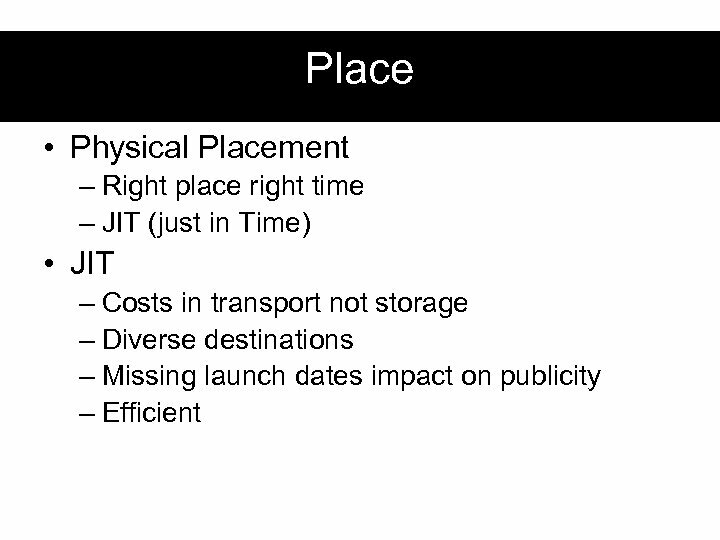 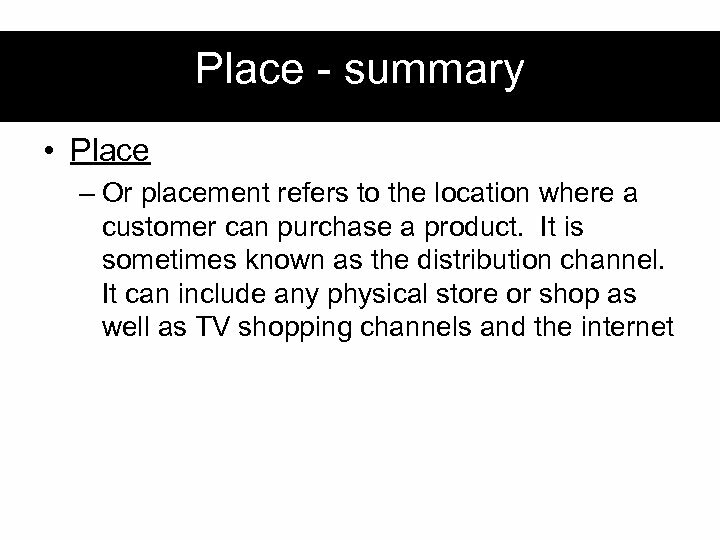 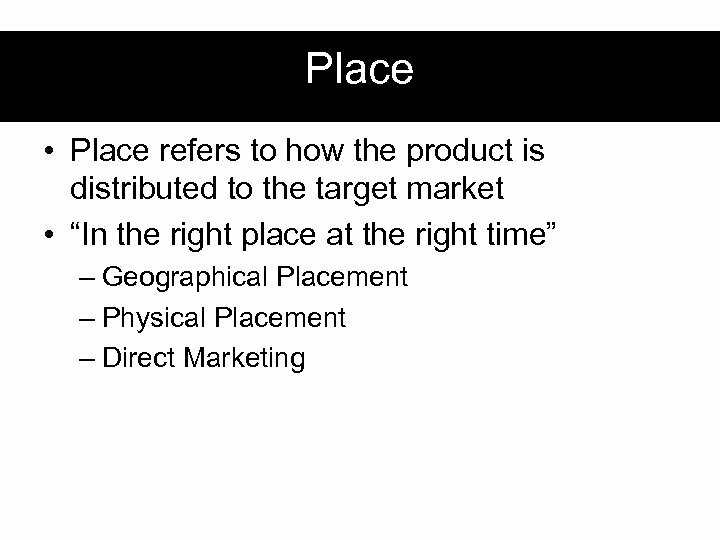 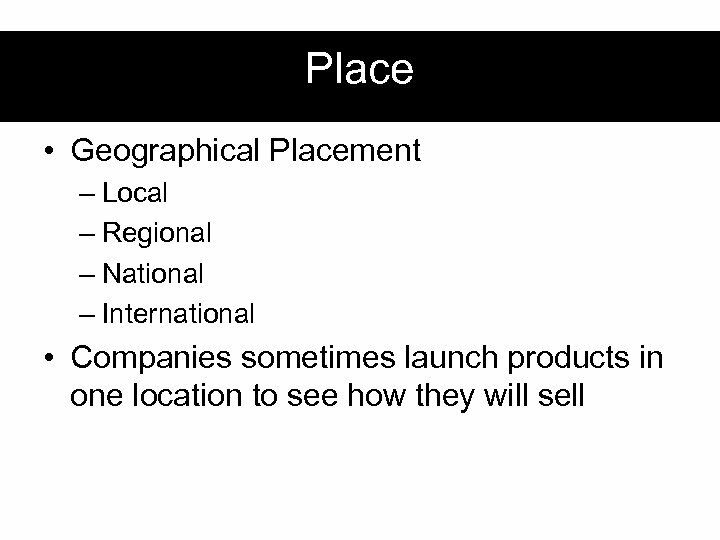 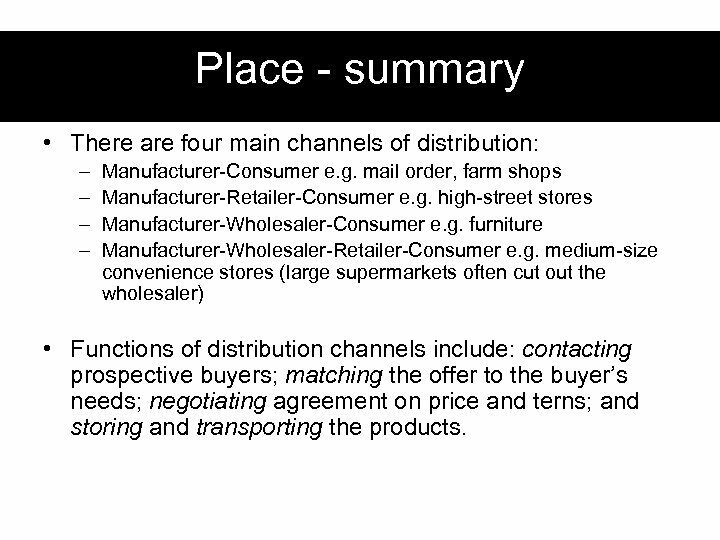 Place - summary • There are four main channels of distribution: – – Manufacturer-Consumer e. g. mail order, farm shops Manufacturer-Retailer-Consumer e. g. high-street stores Manufacturer-Wholesaler-Consumer e. g. furniture Manufacturer-Wholesaler-Retailer-Consumer e. g. medium-size convenience stores (large supermarkets often cut out the wholesaler) • Functions of distribution channels include: contacting prospective buyers; matching the offer to the buyer’s needs; negotiating agreement on price and terns; and storing and transporting the products. 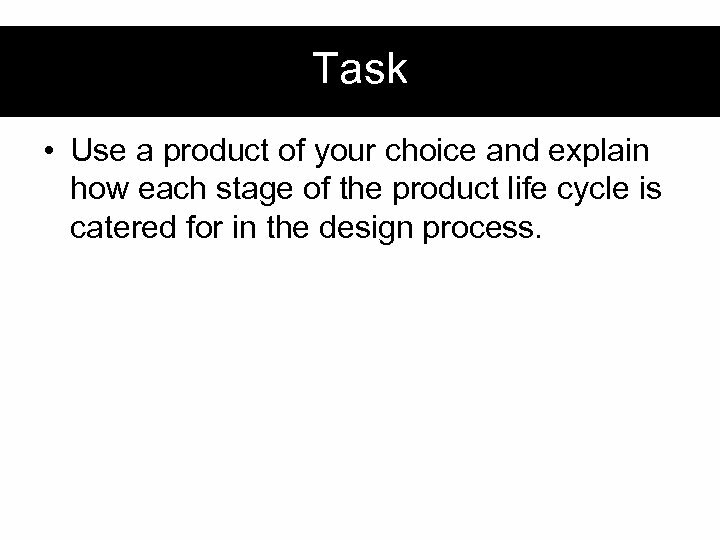 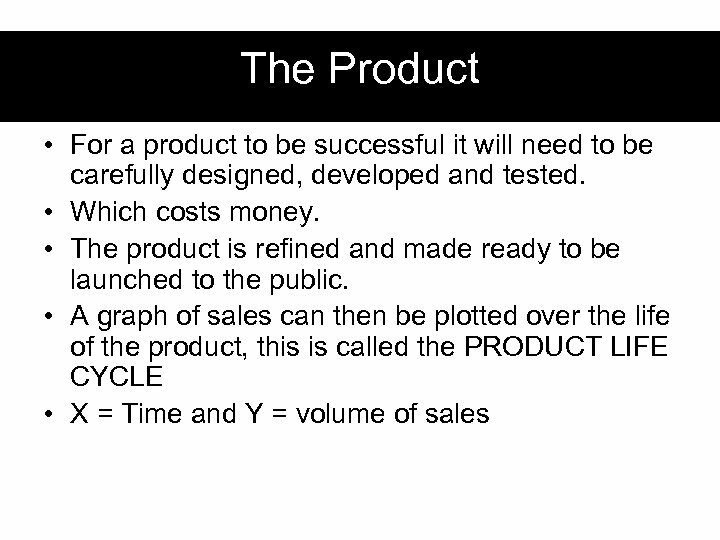 Task • Use a product of your choice and explain how each stage of the product life cycle is catered for in the design process.